We got our van back! Last Friday we signed all the papers and drove our new ramp van home. We sent Caleigh's van off on April 15th. The modification took a little over six weeks to complete. During this process we drove our old van around. It wasn't too hard, but I must admit that I missed my shiny new van a lot. Caleigh was pretty angry about it and had a rough week of adjustment. She kept telling me that she was "mad." 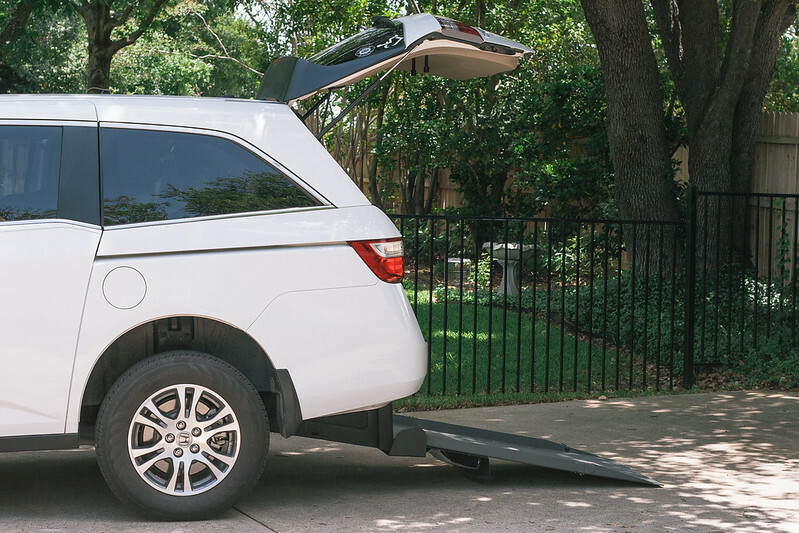 "We decided on a short-cut rear entry. This means that the second row will not be touched. The ramp will be in the back only. We have strong feelings towards Caleigh staying in her car seat as long as possible. We love our comfy leather factory seats. The ability to recline those seats was a huge factor in keeping that second row. After years of back and forth on this decision, I am confident that we made the right one." Without a doubt, now that we have our van back, we believe that this is still 100% true. This conversion allows us to keep our second row. With a rear entry van they have to move around the "guts" of the van that are underneath the ramp area. So the second row was moved out, but replaced the way it was. New carpet was laid throughout as well. Right now we have the middle seat out of the second row, but it's easy to pop in when we have extra passengers. There is also a third row, fold down, bench seat option that we decided against. We just don't need that much seating. 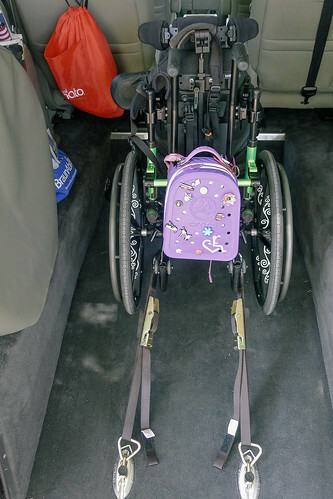 If it wasn't for Caleigh's wheelchairs, I would still be driving my tiny Corolla. We decided on a completely manual ramp. Since our rear hatch is motorized, this isn't a big deal. I pull the handle and set the ramp on the ground. It takes seconds. Eric and I didn't want anything that could break further down the line. An extra motor and something electrical adds to the risk. I'm much faster pulling the ramp down than the motorized one would be anyways. In rain, heat and cold this matters. Plus it was just more expensive to have that option. We are already talking about putting down some sort of carpet covering in the ramp area. Just in the past few days it has really picked up dirt. Maybe linoleum or one of those office chair mats? I'm not sure who thought carpet would be a good idea, but I guess it gives the flow of the conversion more consistency visually. As of right now, we are using the ratchet straps that came with the modification. 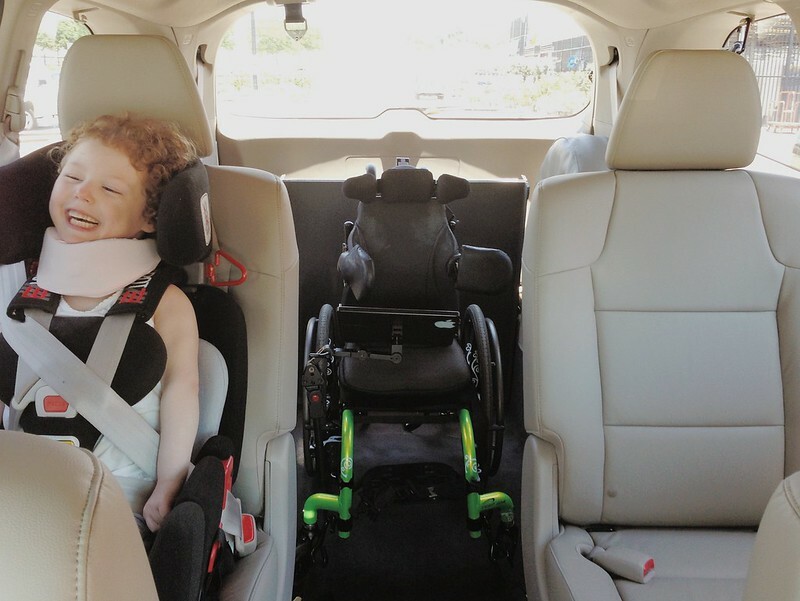 In a couple of weeks we will be getting an EZ-Lock system mounted on the van and Caleigh's power chair. We will be able to roll the chair in and a mount will lock onto the chair automatically. We will still use the straps for her manual chair. 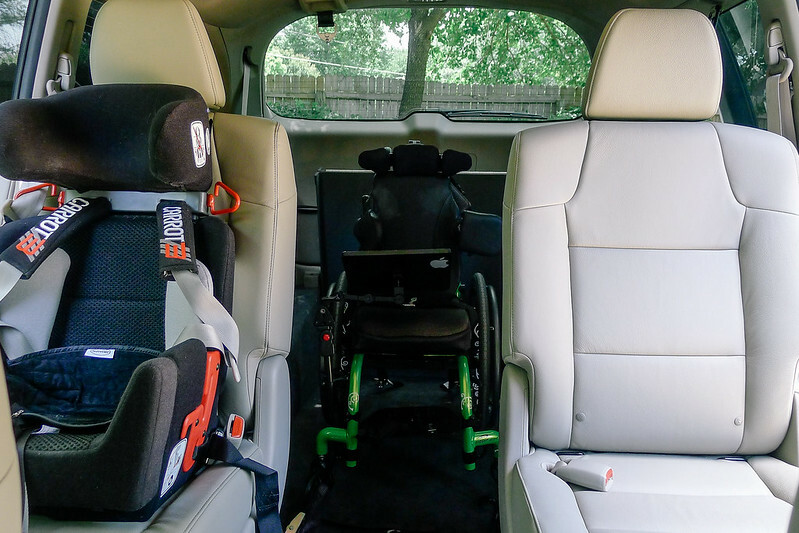 Even though we are pretty certain that Caleigh will be in her carseat for the foreseeable future, we do plan on letting her ride in her power chair from time to time. On the way home from the grocery store and quick trips down the road come to mind. 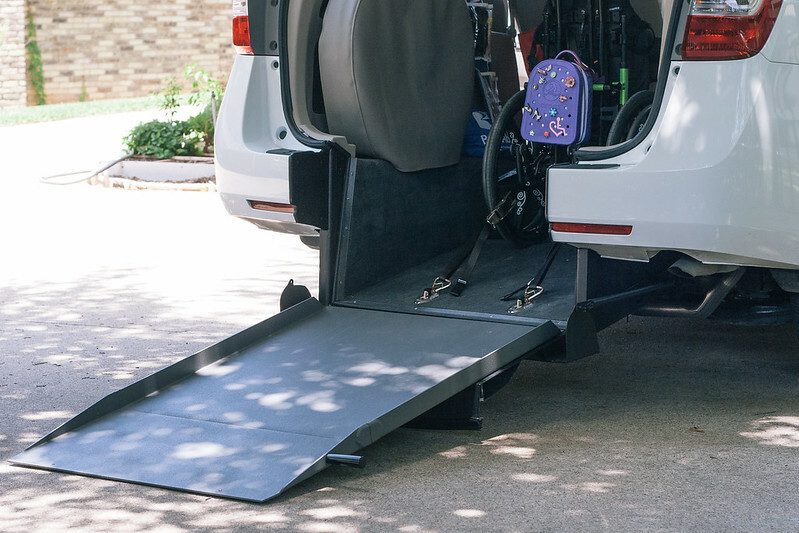 Just because the ramp doesn't go all the way to the front seats doesn't mean that she can't use it in the same way. There are extra straps involved for this setup. They resemble a lap and shoulder belt. 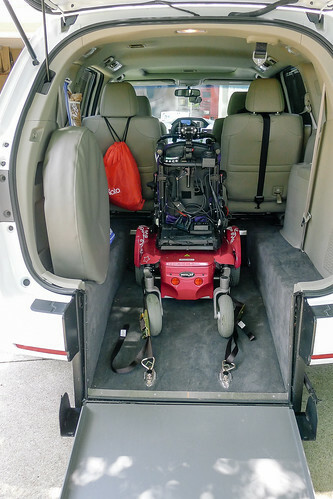 The van is raised slightly in the back to accommodate the lowered floor. I think it looks fine. The exhaust was moved, and unlike the VMI brand conversion that I drove, there isn't a loud muffler sound. Imagine a V8 truck with pipes. Our conversion doesn't sound any different than it did before. Thank goodness. So here's the deal. Not one person told us about the short-cut rear entry van. 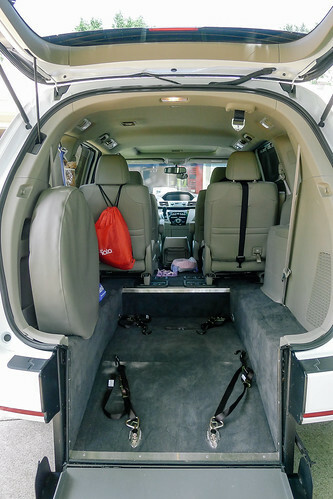 The sales people want you to buy a side entry van with all the bells and whistles. If you show interest in the rear entry van they only discuss the long cut. I found the short cut on my own. I even called the company and they tried to talk me out of it. The cost is the same between the two rear entries. They repeatedly told me that Caleigh would be "too far back" for me to get to her. Um, if I'm driving I can't get to her anyways. In reality, she's not that far away than she is in her car seat. 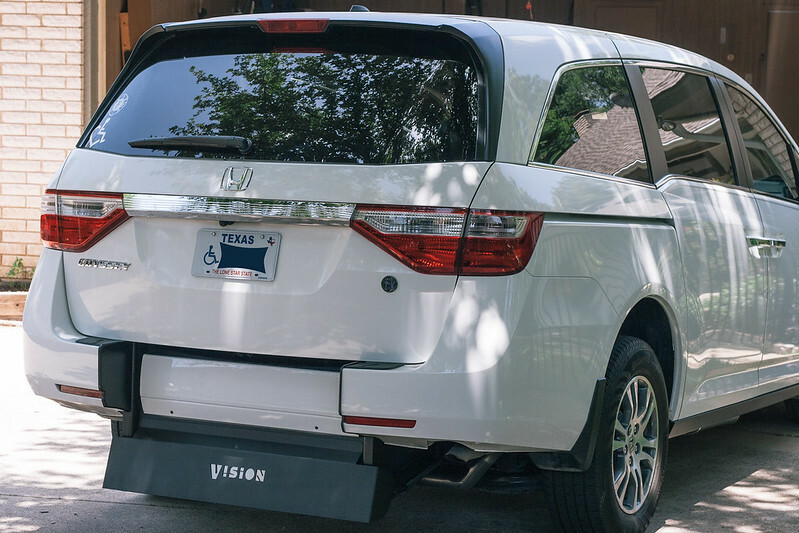 We did not see one photo of this conversion before we hit the go button. I was told that they rarely do the short cut. 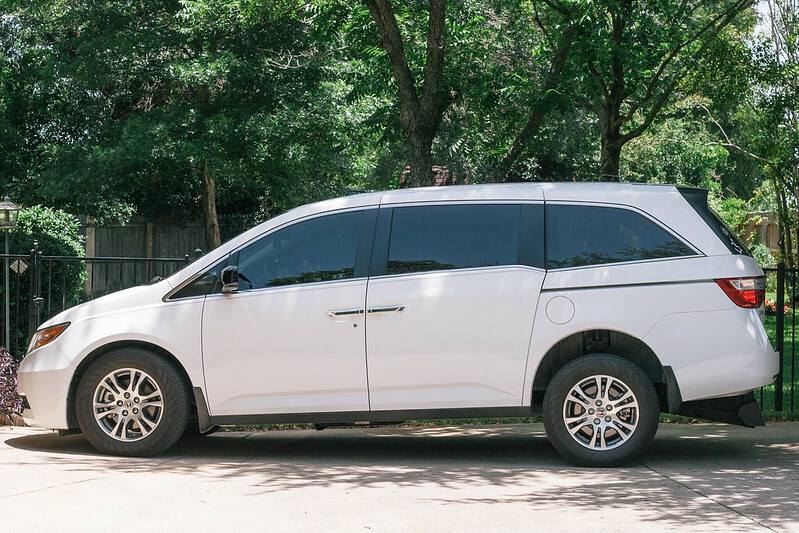 Well, I'm here to tell everyone that I love it and now the internet has some photos of a rear-cut entry van that it didn't have before. 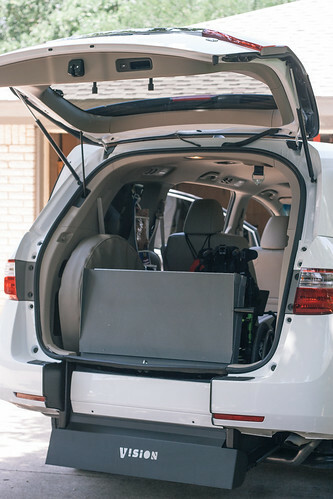 It takes our van to the next level for our family. It's what is best for us and that is what ultimately matters. My back feels better already and travel just became SO much easier! 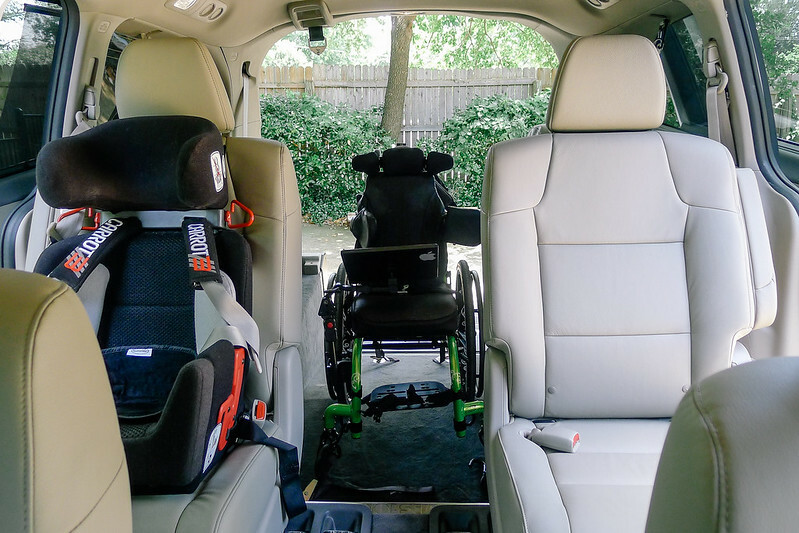 We want to thank Caleigh's Grammie and Grampa and Mimi and Pop for all of their help making this van a reality. Love y'all bunches!